After the holidays the January Blues started to hit me, hard. Chilly weather and short days can get so monotonous in the City. But I was determined to focus my energy on a New Year, even better me by concentrating my energy on positive changes & self love. I was so excited when Noelle suggested we do a friend slumber party/staycation! 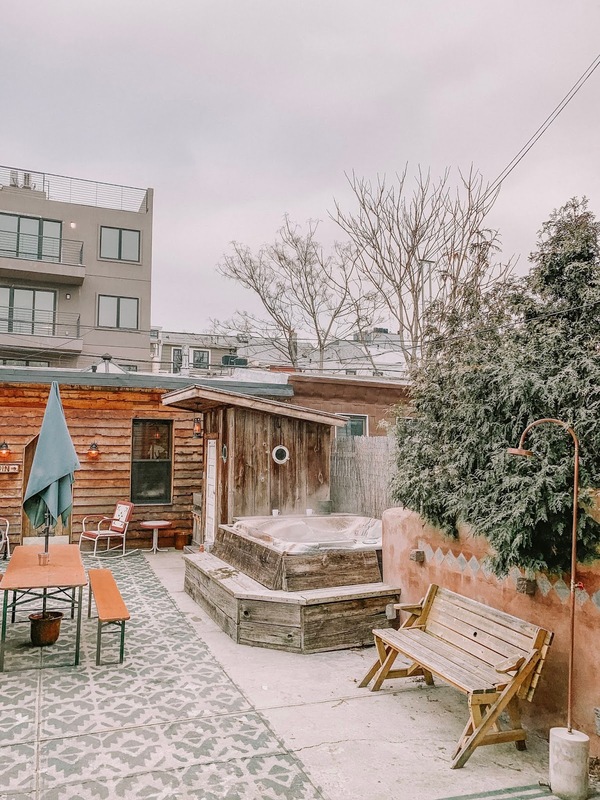 We booked an AirBnB in Brooklyn with a hot tub to soak & relax our worries away. It was the perfect opportunity to show off our new swimwear favorites from Aerie. I’ve been a fan of Aerie for years and I have especially loved their commitment to body positivity & inclusivity showcasing their models with zero photoshopping or retouching on a variety of real body types & amazing, diverse models. I chose a simple black bandeau top with super flattering high waisted bottoms. This Spring, for the 4th year in a row, Aerie is launching their Love The Swim You’re In campaign. For every 100% unretouched swim photo shared with #AerieREAL @Aerie, Aerie will donate $1 (now up to $50,000!) to the National Eating Disorders Association (NEDA). I’m encouraging my readers to share their beach body because every BODY is a perfect beach body! It’s such a pleasure to collaborate with a brand that values body positivity, inclusivity & positive image and representation for all women. Special thanks to Aerie & ShopStyle for sponsoring this post & stay tuned for more #AerieREAL content from yours truly. This staycation looked like so much fun! Especially great when you can vacation together with your friend, Noelle. This Aerie swimsuit is getting me sooo pumped for the spring and summer season.